Tradition says a small church dedicated to San Demetrio (Saint Demetrius), the martyr of Thessalonica, was built here in 836, but the first documentation dates to 1083. In 1170 the church was rebuilt and re-dedicated to San Bartolomeo, being used from the 13th century onwards by German merchants from the nearby Fondaco dei Tedeschi (which is now a glitzy shopping mall) the minister here being used for baptisms and funerals by the Germans as an 'official' front for their secretly-observed protestant beliefs. The church is said to have been used as a civil service school in the 15th century. 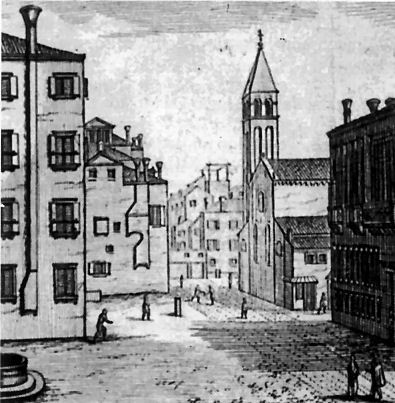 A rebuilding of 1723, possiblyby Giovanni Scalfarotto, is the church we see today. It was closed and deconsecrated in the 1980s following decades of neglect, and reopened as an art gallery. After a recent restoration it was being used for concerts. Only a door and the campanile base can be seen at street level. The carving of the grotesque face over the entrance at the base of the campanile may be a reference to the suffering of Saint Bartholomew, whose martyrdom involved being whipped and flayed. 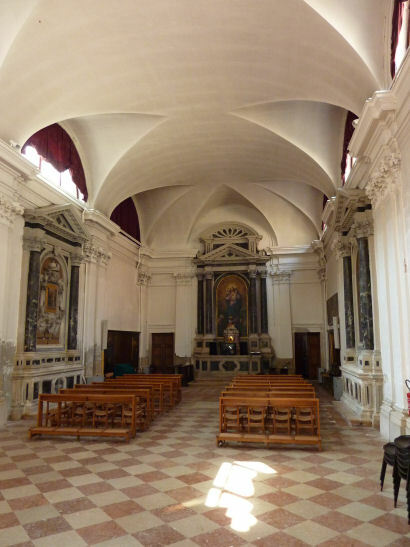 All the art (including paintings by Palma Giovane and sculpture by Heinrich Meyring) was removed when the church was deconsecrated, apart from the sculptures by Meyring on the altar and the choir loft at the rear of the church. A fresco over the altar also remains - Saint Bartholomew in Glory by Gian Maria Morleiter. For a small church that's now never open this church has seen some good stuff, all painted in the first decade of the 16th century. Dürer painted the Madonna of the Rosary (see above) now in the National Gallery in Prague, for this church in 1506 as it was then the church used by the German community. 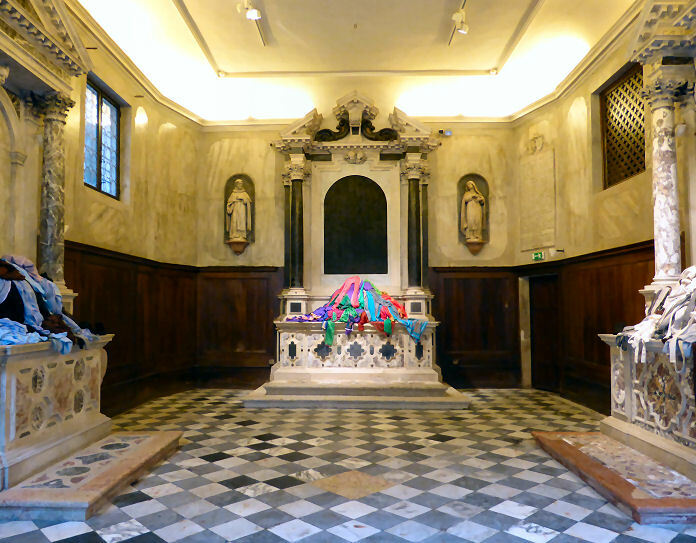 It was commissioned by merchant Christopher Fugger, who is buried in the church, and was originally placed over the altar of the Confraternity of the Rosary here. It shows the influence on Dürer of Venetian painting generally, and Giovanni Bellini very much. 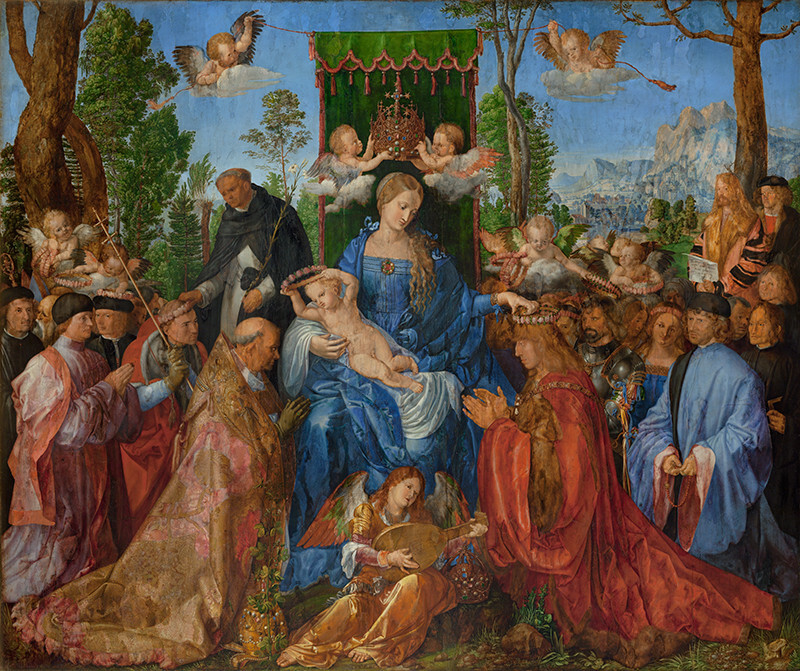 Dürer incorporated a self-portrait into the painting, over to the right in front of the tree, and Emperor Maximilian, being crowned by the Virgin. The painting was acquired by the Habsburg Holy Roman Emperor Rudolf II not long after its installation in the church and he had it packed in cotton wool, carpets and waxed linen and carried (upright suspended from a pole) over the Alps by relays of strong men. It was thought to be too big, damaged and fragile to transport when the Habsburg collections were moved to Vienna when it became the centre of the Empire, so alone amongst their treasures it remained it Prague. Also a Virgin and Child with Saints by Giovanni Buonconsiglio from 1502. 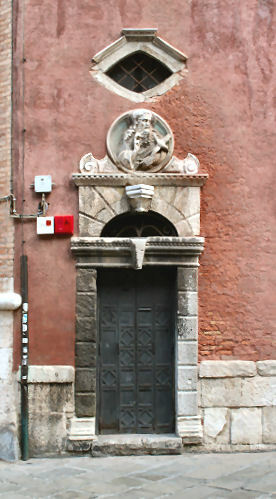 Vincenzo Catena lived in a house in Campo San Bartolomeo, and died there in September 1531. I did not go to look at the works of Sabastian del Piombo which it contains, fully crediting M. Lazari's statement, that they have been "Barbaramente sfigurati da mani imperite, che pretendevano ristaurarli." (barbarously disfigured by inexpert hands, which claimed to be restoring them) Otherwise the church is of no importance. Dates from building of 1170, but rebuilt following damage during the earthquake of 1688 by Giovanni Scalfarotto 1747-54 with an octagonal drum and onion dome, based on Tirali's campanile for the nearby church of Santi Apostoli. The old spire is just visible in Marieschi's The Rialto Bridge from the Riva del Vin (detail right). In Guardi's The Rialto Bridge from the North... of about 1768-9 you can see the new dome at far left. The website for San Salvador used to give opening times, but I never found it open. Now it says TEMPORARILY CLOSED FOR RESTORATIONS . Facing the side entrance to the Basilica San Marco, the original church on this site was built in 1076 and was rebuilt after the fire of 1105 which destroyed 23 churches in total. It was again damaged by fire in 1661, when the altar decorations caught fire, and rebuilt in 1665. 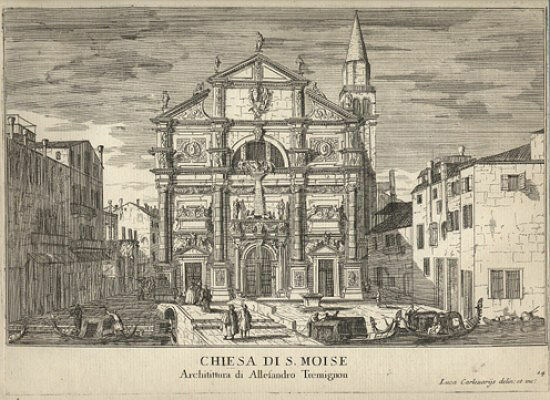 This last church, the current building, was probably designed by Giuseppe Benoni with the facade (right) added 10 years later by Baldassare Longhena, but never finished - its upper part was never built. 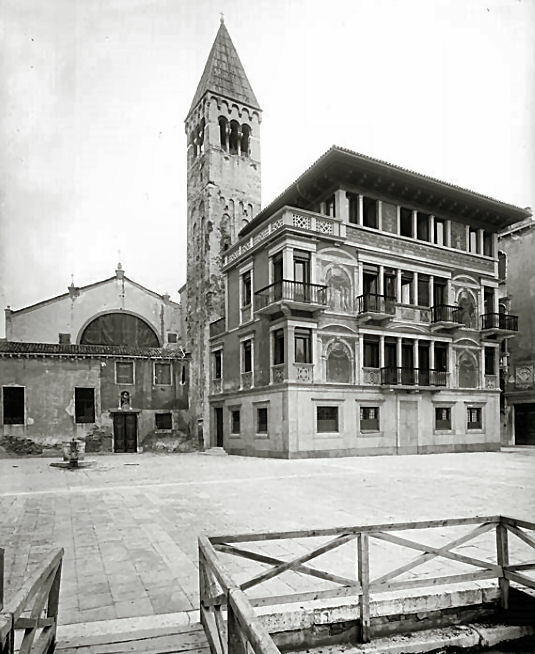 A small campanile was built but later demolished. Closed by the French in 1810, the church was later used to house and restore works of art belonging to the Basilica, and as an antique shop. It was restored in 1951 and has since hosted exhibitions and Vivaldi concerts. It needs a good clean. 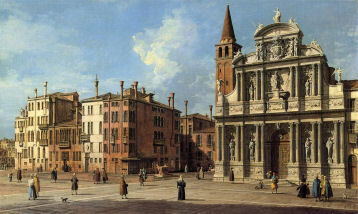 The Piazzetta di San Basso by Michele Marieschi (San Basso's façade is to the right) (see left). 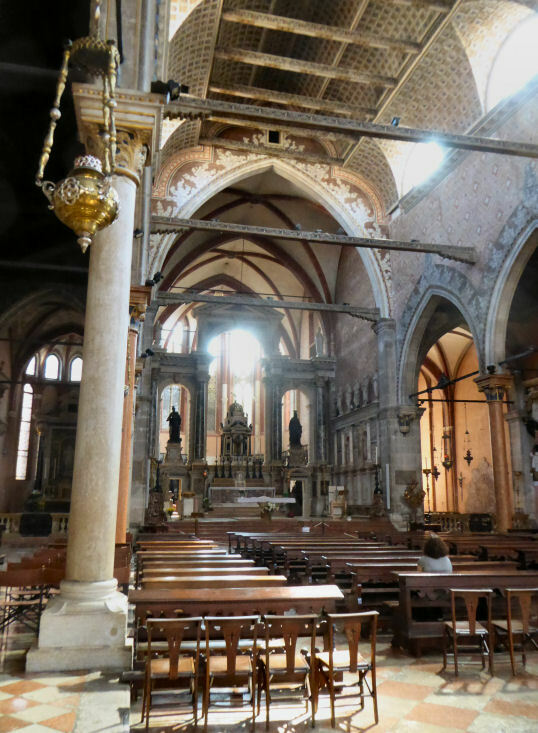 The church is first mentioned in the 10th century as being founded by the Caloprini, Burcali and Falier families. It was given in 1013 to the Benedictine monastery of Santissima Trinità e San Michele Arcangelo in Brandolo, near Chioggia, by Giovanni and Domenico Falier. They presumably renamed it after their founder - Beneto is Venetian dialect for Benedetto. 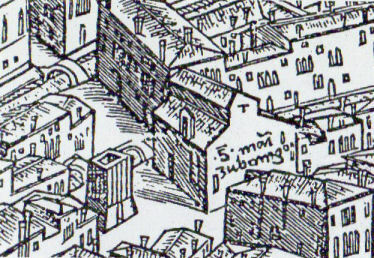 In 1167 a fire destroyed the original church and the second church, as seen in the Barbieri map (see below), was built. It passed to Cistercians at the behest of Pope Gregory IX in 1229. 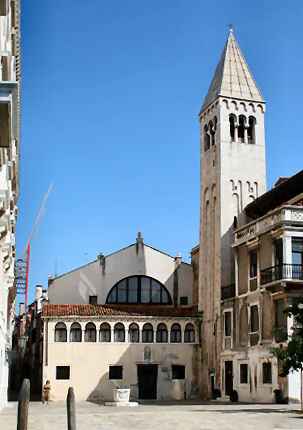 The order neglected the church, however, and in 1435 the first Patriarch, Lorenzo Giustiniani, made it a parish church. 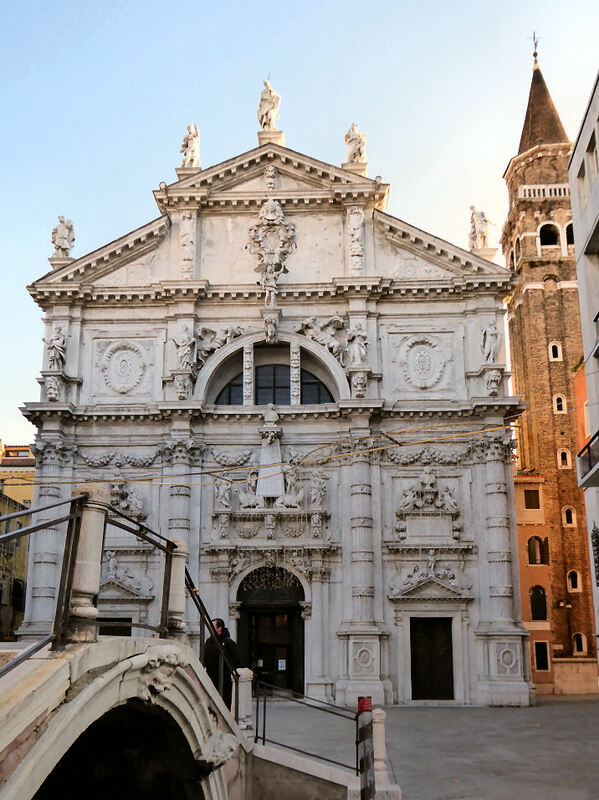 The structure of this church became dangerous following the collapse of the campanile and so the current building, the third, which dates from 1619-1629, was built under Patriarch Giovanni Tiepolo, architect unknown. The church was closed in the early 20th century. Said to contain 17th and 18th century works by Carlo Maratta, Jacopo Guarana, Sebastiano Mazzoni (two paintings featuring Saint Benedict, including Saint Benedict Presents Pasqualino Daneli to the Virgin), Antonio Fumiani, and Gaspare Diziani. Also a Giambattista Tiepolo San Francesco di Paola in Ecstasy from 1738/9, said to be 'rather faded and over-cleaned'. This last overzealous restoration was carried out in the 18th century and has been somewhat ameliorated by restoration in 1994, which also had to deal with water damage. Also the 'boldly painted' Saint Sebastian Tended by the Holy Women by Bernardo Strozzi, known as 'the Genoese priest'. For the second church Jacopo Tintoretto painted a high altarpiece, a Nativity of Christ for the Contarini chapel and the organ's shutters and two works to decorate the organ gallery. The two altarpieces disappeared during the 17th century rebuilding, but the four canvases painted for the organ have survived, albeit cut down, and are now elsewhere. The Annunciation from inside the organ doors is in the Rijksmuseum in Amsterdam. The scenes from the exterior are in the Uffizi in Florence. The organ canvases remained here into the third church but were removed in 1730 and sold to pay for the restoration of the organ. 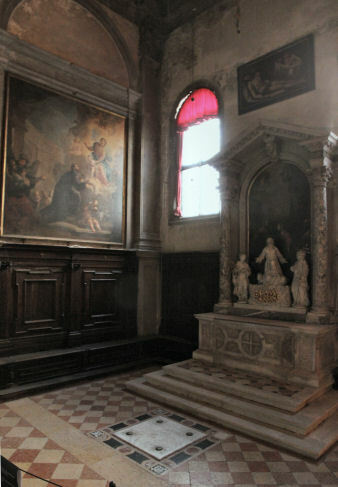 Controversy surrounds the assertion that the painting from the high altar is the Tintoretto Madonna and Saints (see right) now to be found in the Galleria Estense in Moderna. The original campanile, with a sugar-loaf spire and four pinnacles, can be seen on the Barbari map. It collapsed on the 26th November 1540, severely damaging the church. It was replaced during the 1619-95 rebuilding by the current one, which has an octagonal drum and onion dome. This church has undergone comprehensive restoration quite recently but remains closed. Update December 2018 Press reports talk of a gathering of worthies to celebrate San Beneto reopening after 40 years closed. March 2019 Correspondents on the spot have yet to find it open. Watch this space for further updates. and Prince Carlo Ruspoli at San Beneto in September 1927. Said to have been founded in the 9th century but the earliest documentary evidence dates from 1127. Rebuilt in the 15th century in a nave-and-two-aisles form, as clearly visible on the Barbari map. This church was demolished in 1506 and a new one begun the following year. It was to a design by Scarpagnino, who worked on the building until his death in 1549 when Jacopo Sansovino took over (with help from Alessandro Vittoria), designing the domed apse, and this building was completed in 1564. This was the guild church of the Scaleteri (vendors of biscuits and sweets) whose patron saint is San Fantin (Saint Fantinus of Calabria ). Amongst the church's relics are the body of Saint Marcellina (the older sister of Saint Ambrose of Milan) and an arm bone of Saint Trifone. A plain façade and exterior of Istrian stone. 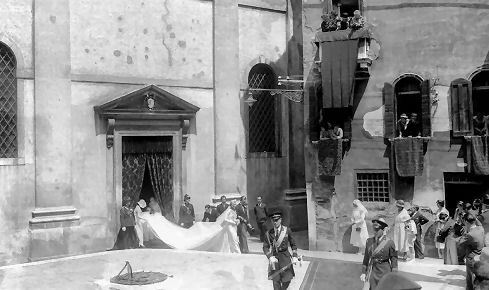 The exterior view of Sansovino's apse was blocked by some 'poor houses' which were cleared away in 1931, as a tribute to Luigi Marangoni, Procurator of San Marco, and paid for by a group of his friends. Monumental and made of squares, I'd read, so was keen to get in and have a look during the 2011 Biennale. The darkness and the largeness of the art made appreciating the interior difficult, but it has an odd and interesting plan and is indeed made of cubes. Grubby dark grey stone detailing, with a couple of side altars visible towards the back. There's a monument to Vinciguerra Dandolo by Tullio Lombardo (an urn over the door to the sacristy) and paintings by Leonardo Corona and his pupil Sante Peranda, and several by Palma Giovane, another of Peranda's teachers. Also a 15th-century Tuscan polychrome wood crucifix the restoration of which was paid for by Venice in Peril in 2002. This crucifix was the one that was carried in front of condemned prisoners from the Doge's Palace dungeons to the place of execution between the two columns on the Piazzetta. Said to contain a John Bellini, otherwise of no importance. This was probably the Virgin and Child with Saint Joseph 'in front of a landscape and damasked curtain' which Crowe and Cavalcaselle in their History of Painting in Northern Italy in 1871 described as being by 'a nerveless follower of Bellini in his last days'. It's now thought that this could well be the Holy Family by Pier Francesco Bissolo which is now in the Sant’Apollonia Diocesan Museum of Sacred Art. There's also talk of a Tintoretto Visitation and two by Piazzetta - a Pieta and The Liberation of Venice from the Plague. Except Summer 2011, when it was open and housing some Biennale stuff, and then after that stuff was removed, until Jan 2012, when it remained open. And Yvonne T took photos (the two to the right). The Scuola has it's own entry on the Scuole page now. Built in 1582 as the chapel of the Ospizio Orseolo, it acquired its present form in 1703. The Ospizio was demolished in 1872, a hotel being built in its place. The high altarpiece Christ blessing with Saints Mark and Gall, attributed to Domenico Tintoretto, now in the Sant’Apollonia Diocesan Museum of Sacred Art, was completely restored in the 17th century by Gaspare Diziani. Little of the original paint surface is said to survive and the picture’s wretched condition makes a certain attribution impossible. Often hosts Biennale exhibits. As it did in 2015. Originally built before 1072 by the Dandolo and Pizzamano families, the present church dates from a rebuilding in the mid-16th century. The collapse of part of the façade in 1827 created an urgent need for more rebuilding in 1832, by Sebastiano Santi, with further major work in 1881. Tucked away just north of Campo Manin, opposite a long-disused cinema, it's orangey pink on the outside and not entirely fascinating on the inside. An aisleless nave with deep apsidal chapels, there is a worse-for-wear late Veronese (c.1581) of Saint Luke in Ecstasy, sitting on his ox, over the high altar. 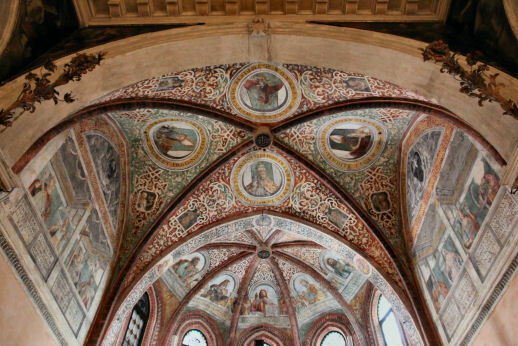 A side chapel has a Palma Giovane Virgin and Saints and there are 19th-century wall and ceiling frescoes by Sebastiano Santi, an artist born on Murano. The church's main claim to fame now is the fact that Pietro Aretino (who lived nearby on the Riva del Carbon) was buried here in 1556, but his tomb was covered over during the 19th-century restoration. This church is also the last resting place of his friend Ludovico Dolce, who died in 1568. He was a 16th-century writer who was something of a hack but very famous in his own time. He is now most known for Aretino and Venetian Art Theory, a book taking the form of a dialogue, with discussions taking in Giorgione, Michelangelo, Sebastiano del Piombo and, mostly, Titian. Aretino and Dolce were said to be so close that they were buried in the same tomb, but this is not true. A German painter called Carlo Loth who died in 1698 was also buried here. Lorenzo Da Ponte, later Mozart's librettist, was a priest here in the 1770s. Whilst living in a nearby boarding house he met Anzolletta Bellaudi, who became his mistress and matched him in dissolution, reputedly indulging in mutual fondling by young men in public, even in church. She bore Da Ponte two children. In 1779 he was tried for living a debauched life, basically, although his borderline heretic views may have been more a factor. The Council of Ten found him guilty and he was banished from Venice for fifteen years. Original erected in 1072, damaged by fire in 1105 with the top rebuilt in 1462. Reinforced with girders in 1966. San Luca turns up oddly often in the sketchbooks of Turner, possibly because it's on one the common canal routes from the San Marco area (where he usually stayed) to the Grand Canal. 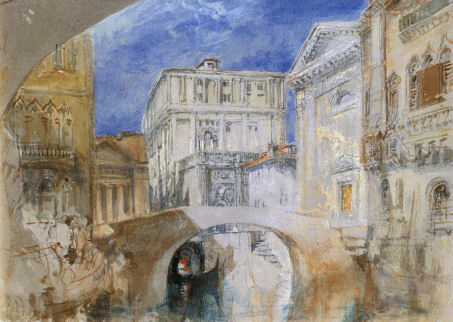 The church is to the right of centre in the luminous watercolour sketch (right) from the Tate Gallery's collection. Tradition says the original church was built in the 9th century, but the earliest recorded mention is dated 1084. Rebuilt after the fire of 1105 and in 1590. The present neoclassical church dates from a rebuilding of 1795-1806, for patrician Pietro Zaguri, by Giannantonio Selva - the façade and altars being by Selva. The work was finished after Selva's death in 1819 by Antonio Diedo and the church consecrated in 1828. This rebuilding was carried out so that this church would replace Sansovino's demolished church of San Geminiano, with the design of the interior supposedly inspired by that church, and the work of Codussi. 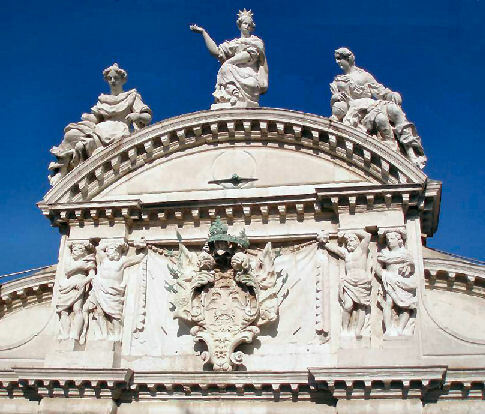 A severely classical façade with an Ionic portal and rectangular reliefs by Bartolomeo Ferrari and Luigi Zandomeneghi either side of the lunette. A relief of the life of the saint is in the pediment above. The church having been deconsecrated, the interior has been stripped and is now full of old violins in display cases - this is now a Vivaldi-related baroque music museum, but is still quite a pleasing square space and worth a visit. It has a Greek-cross plan with a central cupola surrounded by four bays each with a blind cupola. The first church on this site was said to have been built of wood in 797 and dedicated to San Vittore. 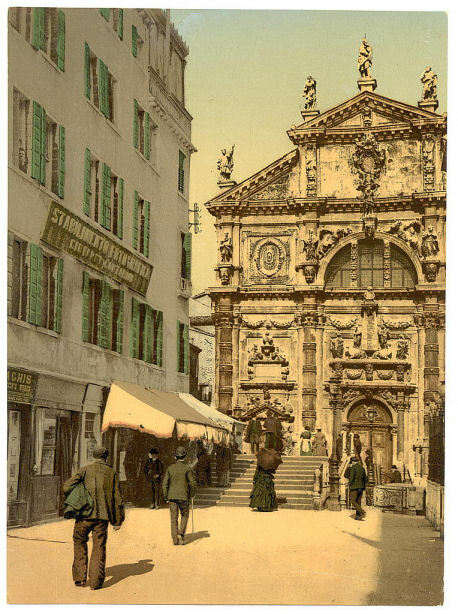 The second was built in 947 by Moisè Venier and dedicated to his name saint. Venetians being in the Byzantine habit of looking upon Old Testament prophets as saints. This church was renovated after the second fire of 1105. The current church dates from a rebuilding of 1632. Work on rebuilding the façade began in 1668 to designs by Alessandro Tremignon, and at a final cost of 30,000 ducats. 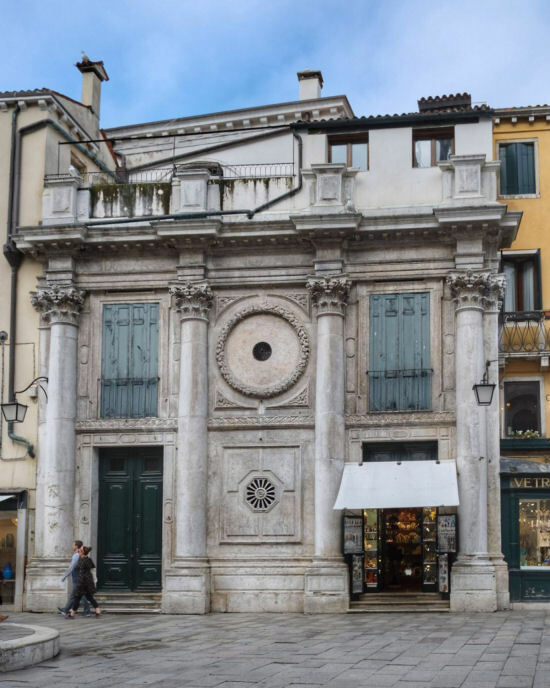 The reconstruction was paid for by the Fini family and it's Vincenzo Fini, who was made Procurator of San Marco in 1687, whose bust sits atop the central obelisk on the facade over the door, propped up by angels, saints and a pair of camels. In the order above you'll find four virtues, with sibyls at the top. The whole theatrical thrust of the facade is to the glory of the Fini, and represents the mercantile lives of the brothers. All the decoration is by Flemish sculptor Heinrich Meyring (sometimes Italianised to Merengo) who also carved the massive sculpture on the altar inside, with the help of Tremignon, seemingly out of a rock. It shows God handing the tablets to Moses. There is also a Washing of the Feet by Tintoretto and a Last Supper by Palma Giovane. The grave of John Law, the man behind the Mississippi Bubble, is in this church, near the entrance. He died in poverty in Venice in 1729. 14th century with fired brick spire. Daily 3.30-7.00 officially, but it seems to be open most of the day. The entrance is under an organ loft which has lost its organ. The church has a nave and two aisles, four arches long with good-looking oil-painted paintings set into the spandrels (see far below). There are four almost identical altars, two on each side at the back and two flanking the apse facing down the aisles. There is no really good art amongst the paintings over the altars or at ground level. The frescoes in the sanctuary are pretty spectacular, though (see above), having been restored by Save Venice in 2000. They are by an unknown artist, show Christ, the Four Evangelists, the Four Fathers of the Church - Saints Augustine, Ambrose, Jerome, and Gregory - and the Eight Sibyls. The frescoes are thought to date to the 1490s and were discovered under a coat of whitewash in 1882. The Crucifix is said to be by either Paolo or Domenico Veneziano. 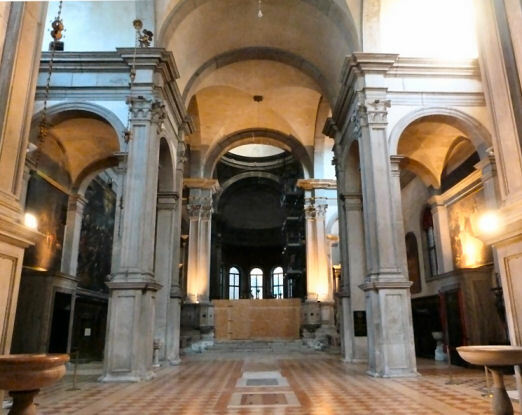 There's also a 13th- century icon (see photo below right) over the altar to the right of the sanctuary, displayed alongside its revetment, It was brought to Venice in 1541 by Francesco Barbaro, who was governor of Nauplia in Greece. Romanesque in style, made of Istrian stone and dating from the 12th century. One of Venice's oldest, but reported to be in a very poor state of repair. 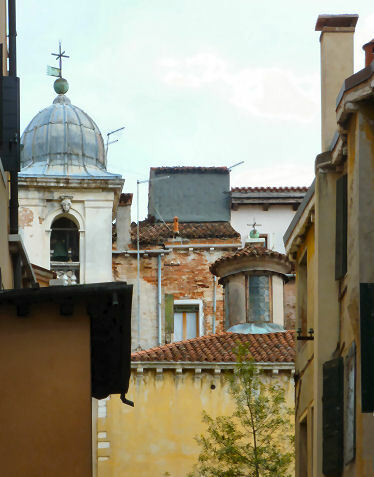 Off of Campo San Samuele, to the right of the church, is Calle Malpiero, where you can see the house in which Casanova was born. This whole area is very Casanova-haunted. He played in the orchestra of the San Samuele Theatre (now a school). His parents were married in this church on 17 February 1724 and he was baptised here. And in 1740, at the age of 15, he gave his first two sermons in this church. The first was a great success – the offertory plate came back not just full of money but with some love letters in it. But the second one was a disaster – he’d eaten and drunk too much, and not prepared properly, and rather than make the ‘brutta figura’ he pretended to faint. And that was the end of his ecclesiastical career. Grand Canal at San Samuele, an impressionistic watercolour by John Singer Sargent. Last opened during 2011 for the housing of the exhibit of Andorra for the Biennale. A photo from the 2011 Biennale website, but as to what and when it depicts...presumably the relaying of the floor and the burials thereby brought to light. Founded in 1084 by Doge Vitale Falier who is thought to have built it in honour of his name saint. Rebuilt after the fire of 1105, and again from 1696 to a design by Antonio Gaspari, commissioned by the Morisoni family as a memorial to Francesco Morosoni, who defeated the Turks at Morea and then served as doge from 1688-1694. Long deconsecrated, the church spent some time as an exhibition hall for the Catholic Union of Italian Artists and now hosts concerts. Restoration work in 1902/3 and 2000. Palladian-style façade (1734-7) modelled on that of San Francesco della Vigna, by Tirali, and paid for by Doge Carlo Contarini. Busts of Contarini and his wife are on the façade, and one of Teodoro Tessari, the parish priest whose efforts lead to the rebuilding. A single nave with side altars. Deconsecrated and formerly used as an art gallery, the church has the stripped-bare look that churches acquire when cleaned out for the purposes of Vivaldi concerts and the selling of CDs. San Vidal on Horseback, a late and handsome Carpaccio (see below right) in which the saint is flanked by Saint Valeria, his wife (also martyred) and Saint George on one side, and Saints James and John the Baptist on the other. 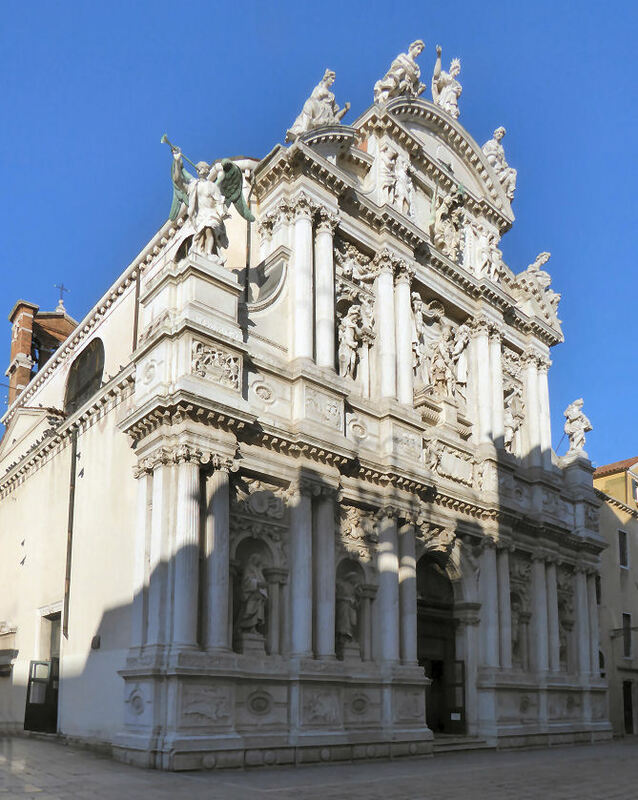 On the balcony are his martyr saint sons Gervase and Protase (the dedicatees of the church of San Trovaso just over the Grand Canal), with Saints Peter and Andrew. Also here is the Guardian Angel with Saints Anthony of Padua and Gaetano of Thiene by Giovanni Battista Piazzetta restored by Venice in Peril for the Glory of Venice exhibition at the Royal Academy in London in 1994. Originally of 1084, rebuilt after the 1105 fire, like the church. Further restored after an earthquake in 1347, and again in 1680. A door in its base (see far right) is surmounted in an almost convincing fashion by a fragment of a 12th century cornice and a 15th century relief roundel of Saint Gregory. Canaletto's Campo San Vidal and Santa Maria della Carita (The Stonemason's Yard) in the National Gallery in London is said to depict masons working on the stonework for San Vidal's rebuilding. 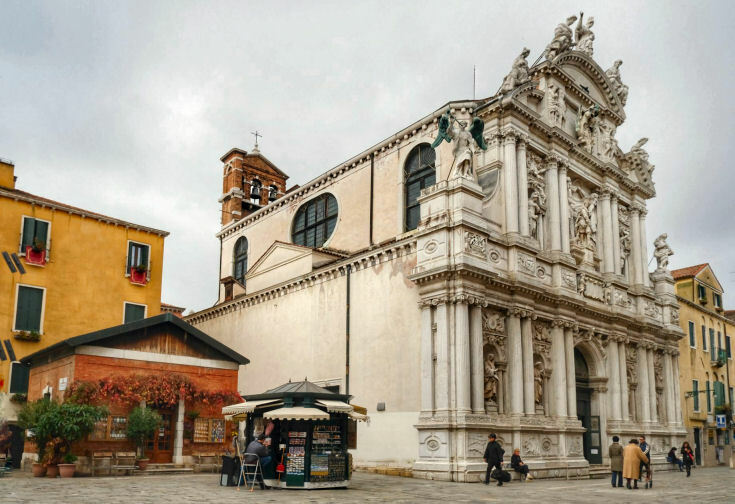 Tradition says that the church of Santi Zulian (Venetian dialect for San Giuliano) e Basilissa was founded around 829, but the church is first documented in 1061, and some sources say that it was rebuilt after the second fire of 1105, at the expense of the Balbi family. By the mid-15th century this church is said to have been in a poor state. The current church dates from a rebuilding commissioned in 1553 by Tommaso Rangone, a physician and astrologer from Ravenna who could not be accused of undue modesty. He made his fortune from syphilis cures and wrote a book on how to live to 120 which was based on his observations regarding the longevity of Venetians. (He lived to the age of 84, since you asked.) His obsession with longevity may explain his ceaseless quest for immortality in paint and stone. He is depicted in major roles in Tintoretto's paintings for the Scuola di San Marco (now in the Accademia) for which he became Guardian Grande. He had also wanted to be commemorated by an effigy on the façade of San Geminiano, the church which used to face the Basilica across Piazza San Marco, but this request was refused by the Signoria as too vainglorious. Jacopo Sansovino was put in charge of San Zulian's rebuilding, which began in 1566, after thirteen years of fund raising. But while he was building a new façade the roof collapsed and he had to start again from scratch. Alessandro Vittoria collaborated with him towards the end, and the church was finished and consecrated in 1580, ten years after Sansovino's death. Rangone kept the architect's model and made arrangements for it to be carried in procession during his funeral. He's buried in the chancel here. His marble coffin is said to have been made in the shape of his body. It's also said that his bones were transferred to the island of Sant'Ariano in 1822. That's a bronze statue of Rangone by Sansovino, made in 1554, in the arch over the door (see right). Rangone is depicted holding sarsaparilla and guaiacum, two of the ingredients of his syphilis cure. The portico is recessed, rather than sticking out, because of space constraints. The façade also features odd symbols and inscriptions in Latin, Greek and Hebrew telling us what a great and generous man Rangone was. 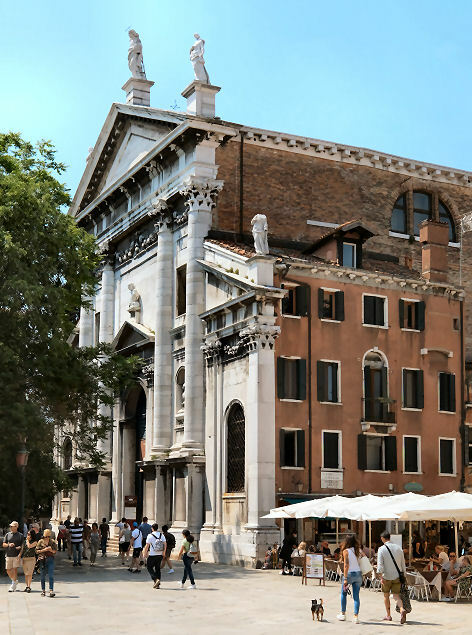 This is one of only two freestanding churches in Venice (i.e. ones that can be walked all around). The other is Angelo Raffaele. Much work was carried out here by Venice in Peril in the early 1990s. This included cleaning and applying protective substances to the façade and the statue of Rangone, which also needed protecting from pigeons. Much work was done then on the interior too. A square aisleless nave almost totally, and oddly, free of architectural detailing, having just two Corinthian pilasters framing the sanctuary, but there's lots of gold and works by Palma Giovane including, I have to admit, quite a nice Assumption. Appreciation of the painted ceiling is much improved by putting some coins in the light, but it is a light of somewhat stingy duration. 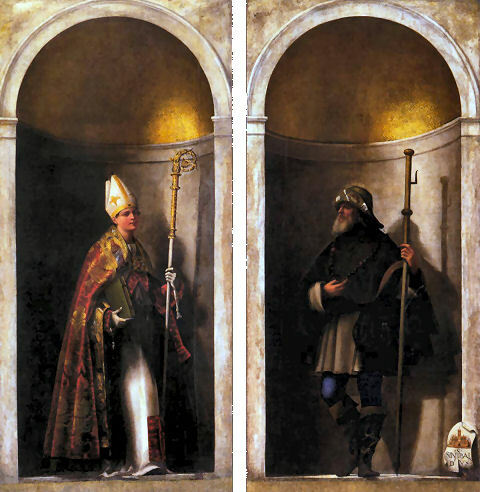 Saints by Vittoria and four paintings, including the central cross-shaped ceiling painting The Apotheosis of Saint Julian, by Palma Giovane (see below right). 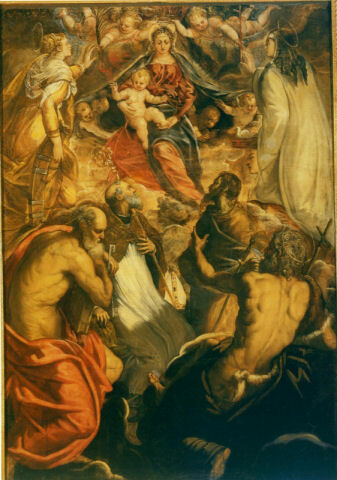 Jacopo Tintoretto famously somewhat desperately subjected himself in his maturity to a competition involving painting the Assumption of the Virgin for the Marzeri (merchants) here. He lost out, by one vote to four, to the young upstart Palma Giovane. The first altar on the right has an unobvious Pietà by Veronese from 1584, with Saints Roch, Jerome and Mark below by assistants. Opposite the Veronese Pietà is Boccaccio Boccaccino's attractive Virgin and Child with Saints, which has a sweet air of Bellini and Giorgione about it. Also a Last Supper formerly attributed to Tintoretto but now said to be by the studio of Veronese. It's mentioned by Ridolfi. During repairs to the roof in 1909 a huge roll, thickly coated with dust and cobwebs, and after much cleaning, it was discovered that the roll consisted of numerous canvases. It turned out that around 1830 the rector of San Zulian, deciding that his church was a bit dark and gloomy, decided to remove the paintings from the clerestory windows and replace them with panels of light-coloured marbles. 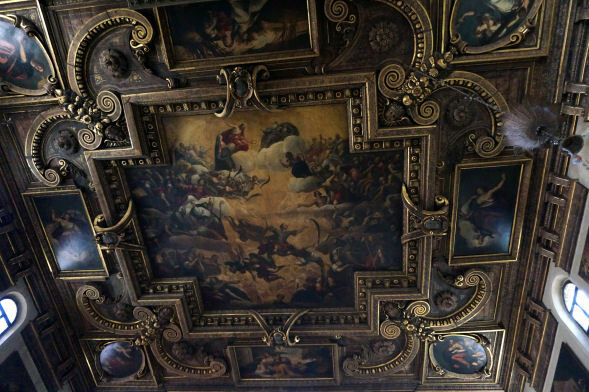 Paintings by Tintoretto, Palma Giovane, Leonardo Corona and others were removed and stashed under the roof. These works were Christ Bearing the Cross at Calvary by Tintoretto; Ecce Homo and The Resurrection, by Palma Giovane; The Deposition, The Flagellation, The Crowning with Thorns, and Christ before Caiaphas by Corona; The Agony in the Garden and The Washing the Disciples' Feet, by Giovanni Fiamengo; and a Saint Jerome, and a Saint Theodore by Andrea Vicentino. A 1909 article in the Burlington Magazine said that the paintings by Tintoretto and Fiamengo were in 'a deplorable state', but that 'it is already supposed that one and all of them will in time be re-hung in the places for which they were originally intended'. Update August 2018 The truth of this (recently discovered) statement needs to be checked. 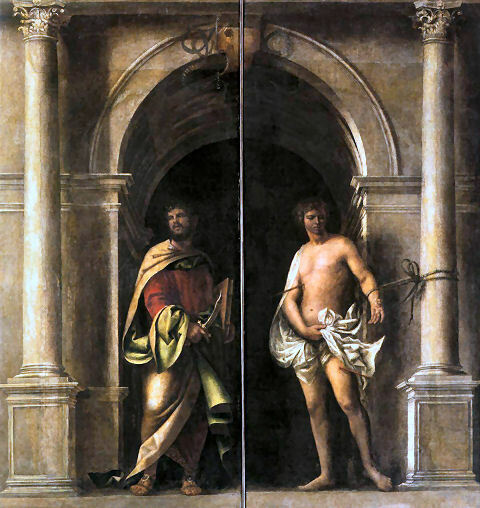 A triptych featuring paintings of Saint Christopher and Saint Sebastian by Antonello and his son Jacobello da Messina either side of a wooden statue of Saint Roch was recorded here in 1581 by Francesco Sansovino. The Saint Sebastian panel (see right) by Antonello, is now in the Dresden Gemäldegalerie. The body of Saint Paul the Hermit was brought here from the church of Theotokos Peribleptos in Constantinople following the Latin Sack of 1204, during the forth crusade. De Barbari's map shows a tower, presumably built during the second rebuilding, topped by a sugar-loaf spire and four pinnacles. 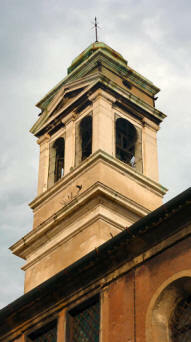 The current tower dates from the demolition of this old campanile in 1775 and is the only one in Venice that rests on the roof of its church. A house on the site was supposedly given to the Armenians around 1253 by Marco Ziani, the son of Doge Pietro Ziani, grateful for the fortune he'd made in their country. An oratory was built in 1496 as Santa Croce di Cristo (the Sacred Cross of Christ). This was rebuilt as a church in 1682-88 and renovated in 1703. 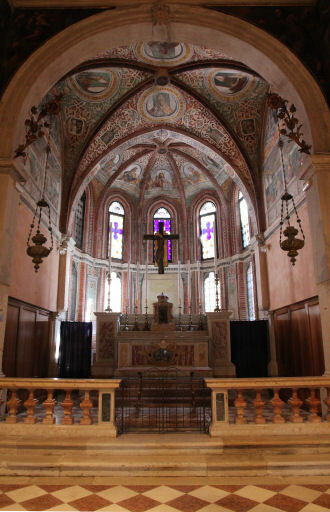 The small Armenian population of Venice later began attending services at the monastery on the island of San Lazzaro degli Armeni and this church fell into disuse. It has recently come into use again, once a month. 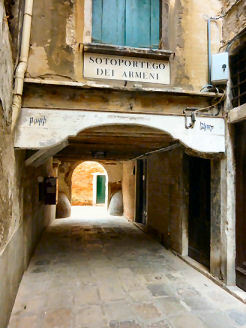 The discrete entrance is off the Sotoportego dei Armeni - the farther of the two doors in the photograph of the sotoportego (see left). The church has a small square interior, richly decorated in a classical style with a central cupola. Sardi and Longhena are sometimes suggested as possible architects. The altar paintings date from the period of the restoration. Hard to see (see right) dating from 1682-88 too, and with an onion dome. For mass only, in Armenian, on the last Sunday in the month at 10.30. The original Byzantine-style church was said to have been founded by the Slav Jubanico family, a name corrupted over time to Zobenigo. Hence the church's other name Santa Maria Zobenigo. The church burnt down and was then rebuilt in 976, and again in 1105. This latter church survived until the present church, whose name translates as Our Lady of the Lily, was built in 1680-83 by Giuseppe Benoni, with the façade and side altars by Giuseppe Sardi. 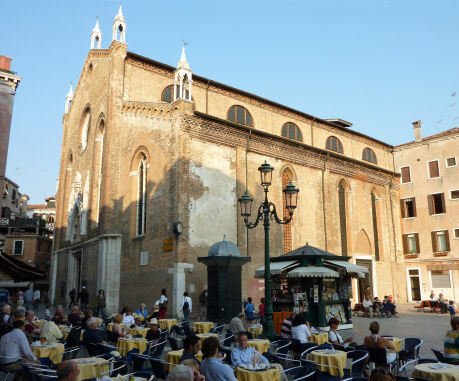 Similarly to the nearby Santo Stefano this church has its side onto a broad campo with its façade facing a narrow calle. It underwent restoration in 1833. The façade is another of the irreligious self-glorifying displays that Ruskin condemned, along with San Moise, as a 'manifestation of insolent atheism'. Here it's Antonio Barbaro who left 30,000 ducats in his will with precise instructions as to how Sardi was to celebrate his political and military careers. 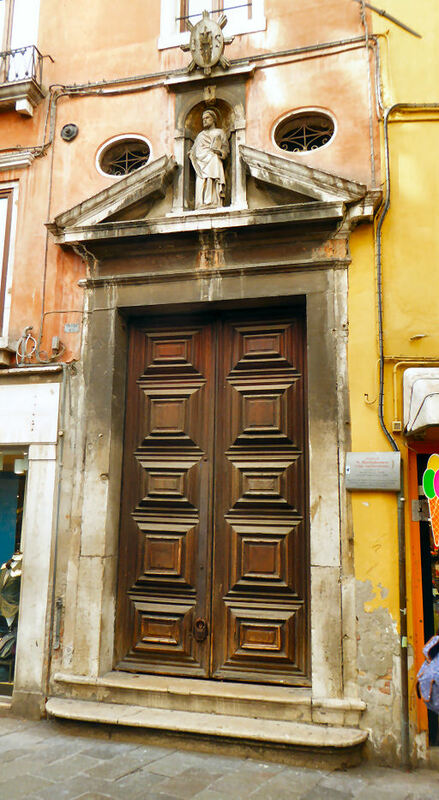 The heavily populated façade has Barbaro's four brothers, clothed according the public offices they held, on the lowest level, with Barbaro himself on the next level up, over the door, all sculpted by Giusto Le Court. Hoards of allegorical figures and putti keep him company. Also some angels because this is a church after all. The plinths under the pairs of Corinthian columns on this upper level show battle scenes, whilst the plinths under the Ionic columns at ground level show plans of the cities of Antonio's military triumphs: Zara, Candia (Crete), Padua, Rome, Corfu and Spalato (Split). A compact and aisleless space, with three shallow altars either side. There's an impressively detailed big arch over the high altar, with an organ behind. Meyring statues of The Annunciation flank the high altar. 17th-century artists dominate, which just about excuses the Rubens, he being of the same period. 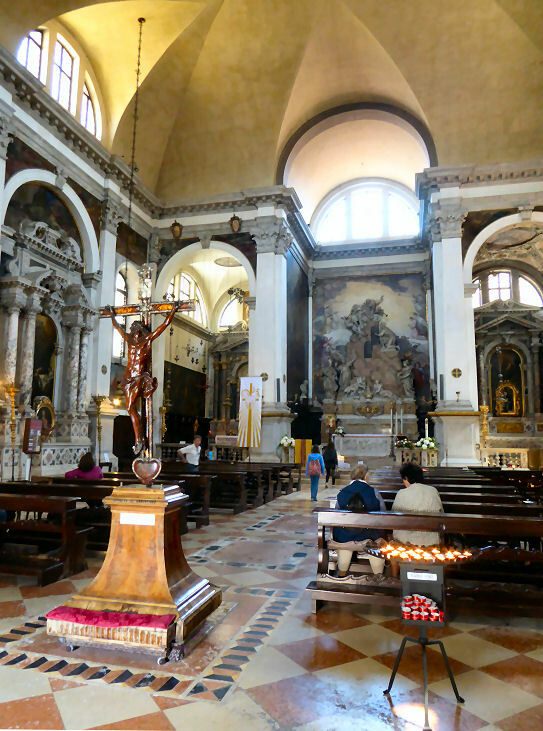 This church has the only Rubens in Venice, you see, behind bullet-proof glass in the Molin Chapel (entrance to the right) - a fleshy Madonna and Child with the Young St John, not really in keeping with its surroundings. And some guide books use words like 'alleged' and 'attributed'. This chapel has a ceiling painting by Domenico, Tintoretto's son, and lots of extravagantly designed reliquaries with bones, nicely labelled. Remains include hanks of hair and other hard-to-identify bits that it's probably best not to know or enquire about. Also an impressive Last Supper by sculptor/painter Giulio Del Moro on the inside front wall, with four cute sibyls by Il Salviati ranged below. The Zanchi paintings high up over the main cornice look impressive from a distance. 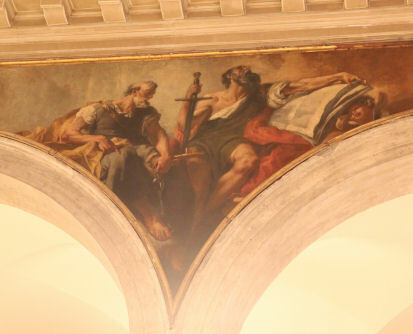 The paintings on the ceiling are by him too. There's also a sweet little carved high relief panel of Saint Jerome, and an overpowering carved baptistery crawling with putti. This is a church whose cumulative pleasures sort of creep up on you. 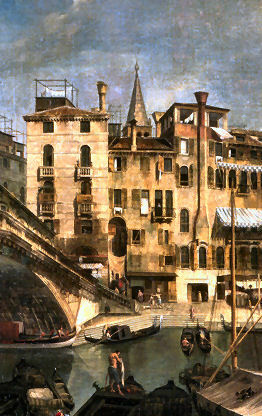 Visible in the Canaletto painting (see below), it was leaning a lot when it was demolished in 1774. Rebuilding began in 1805 but work only reached 26 feet - this stump is now a gift shop (see photo far right). 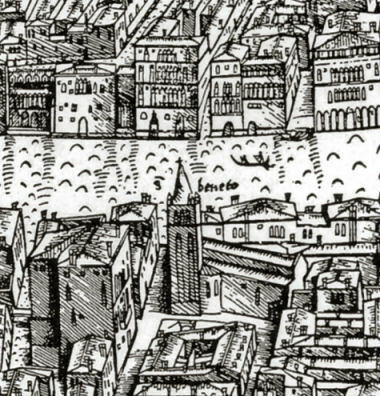 Barbari's famous map shows a stump too (see right) but here it's because the tower was being built, suggesting that an earlier one had toppled too by 1500. Santa Maria Zobenigo by Canaletto (see right) from 1738/40, now in a private collection. It shows the demolished campanile when still intact. Guardi painted an almost identical view thirty years later, even copying some of the figures and groups. So incensed was he at the Barbaro family's vainglorious and atheistic appropriation of this church's façade that when he learnt, during his visit of 1851, that the last members of the once-great family, two old brothers, were then living in the garret of the nearby family palazzo Ruskin wrote to his father So they have been brought to their garrets justly. A convent church was founded here around 1294 by the Augustinian hermits of Sant'Anna in Castello and named for Saints Augustine and Stephen. Work on the current building began in 1294 and was finished in 1325, with major rebuilding in the early 15th century - this being when the chancel was extended over a canal. This latter work was overseen by Gabriele Veneto, an Augustinian worthy and scholar whose portrait was painted by Giovanni Bellini and who is very likely - a strong case has recently been made - the violist in Titian's mysterious and Giorgionesque The Interrupted Concert. Gabriele was buried in the new sacristy here and is commemorated on the lintel over its door. The church underwent further restoration in 1743. Santo Stefano has had to be reconsecrated six times because of, according to Jan Morris, 'repeated bloodshed within its walls'. The first being when Girolamo Bonifazio wounded a monk called Fra Francesco Basadonna on Whit Sunday 1348. Further such incidents occurred in 1556, 1561, 1567, 1583 and 1594. A plain exterior. 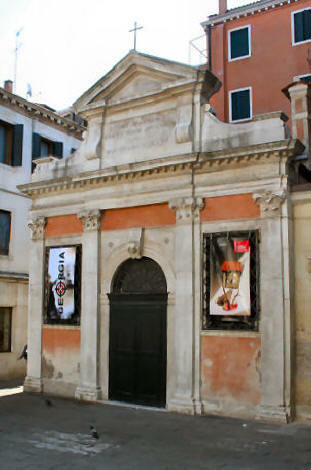 The facade, with a fine late Gothic carved portal probably by Bartolomeo Bon (see right) faces onto a cramped and sunless calle, which does not make viewing it, or photographing it, very easy. The interior is one of Venice's most quietly memorable and impressive. Divided into a nave and two aisles, the walls are painted and gilded in a pleasing diamond and acanthus-leaf pattern and above all is the richly-decorated ship's keel roof probably made in the Arsenale. The columns are alternating red Verona broccatello and Greek white marble, with frescoed arches, and the floor tiles pleasingly compliment the colour scheme. The sacristy is chock-full of paintings, with some characteristic late Tintorettos, including an impressive and large Last Supper, one of the many by him in Venice. 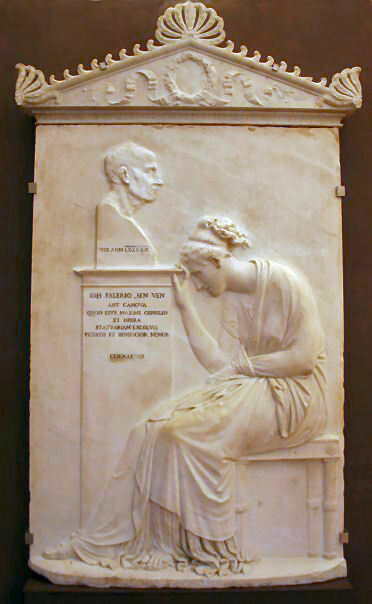 In the small cloister beyond you can get close to some sculpture by Pietro and Tullio Lombardo amongst others, including Canova's tombstone for Senator Giovanni Falier (see below right). 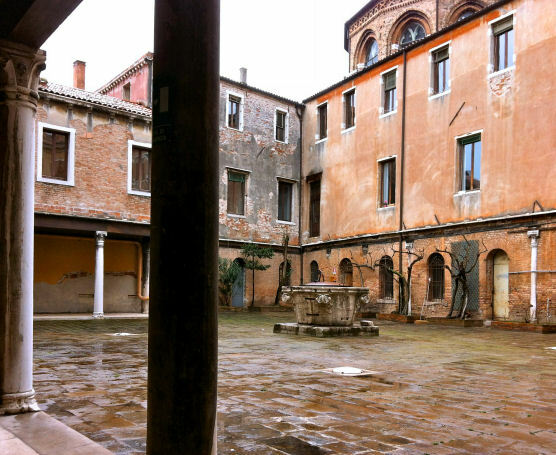 Canova's first Venetian studio was in the cloister here. The Saint Jerome polyptych by Antonio Vivarini and Giovanni d'Alemagna, originally on the right hand wall here, is now in the Kunsthistorisches Museum in Vienna, where it's called The Hieronymus Altar. 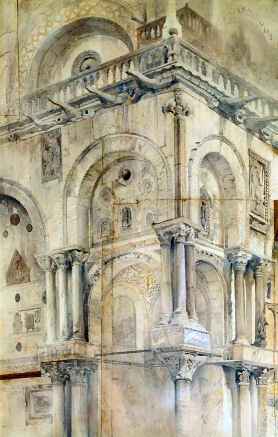 The Church of Santo Stefano, from the Rio del Santissimo, a watercolour by J.M.W. Turner. The church and its campanile feature often in his sketchbooks too. 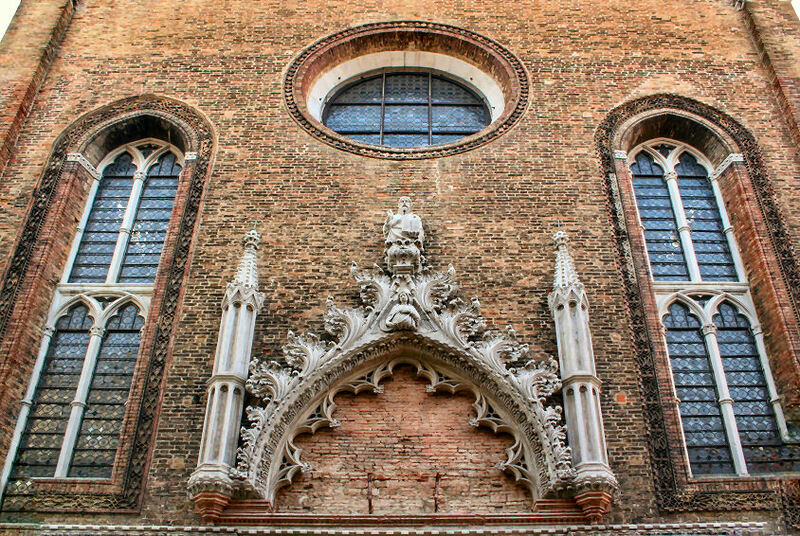 An interesting building of central Gothic, the best ecclesiastical example of it in Venice. The west entrance is much later than any of the rest, and is of the richest Renaissance Gothic, a little anterior to the Porta della Carta, and first-rate of its kind. The manner of the introduction of the figure of the angel at the top of the arch is full of beauty. Note the extravagant crockets and cusp finials as signs of decline. The monastery was suppressed in 1810 and the buildings now house the Ministero delle Finanze. 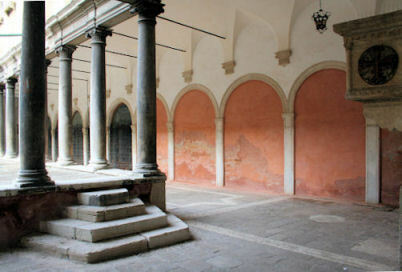 The large cloister, off of Campo Sant'Angelo, can be visited on weekday mornings. It's a handsome one (see photo right) but the wires and air-conditioning units, amongst other impositions, show it to be what you might call a working cloister. Some nice steps, corners and bits of stonework though, so worth a visit. Beyond is a second and smaller cloister (see photo below). One of them was said by Berenson to contain ruined frescoes by Pordenone. Campo Santo Stefano was used for bullfights until 1802, when the last one held in Venice took place here. Late Renaissance (1544) and leaning, with a newer top. On the 7th of August 1585 it was struck by lightning, collapsing onto nearby houses, and the bells melted. 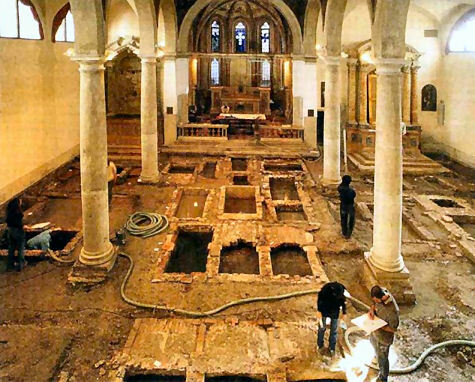 Replacements came from England, where Catholic churches were being stripped under Elizabeth I. Rebuilt in the 17th and 18th centuries. The base was reinforced between 1902 and 1906 due to an earthquake in 1902 and consequent leaning. It is still said to be unstable. The museum out the back (the Sacristy &c) is run by Chorus so you have to pay. 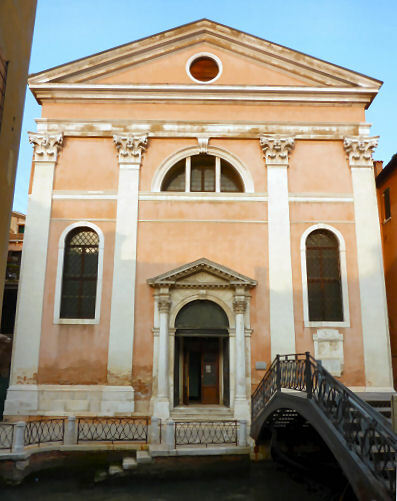 In 1485 the Scuola di San Rocco briefly moved to an oratory on this site with the intention of building a church to house the relics of Saint Roch, its patron saint, but soon moved to their present premises near the Frari. The oratory and some adjoining houses were given to the Cistercian nuns from the derelict monastery of Santa Margherita on Torcello who began construction of the church and convent here in April 1488, with contributions from the Augustinian friars of Santo Stefano and the Lezze family (Luca Lezze was Procuratore di San Marco in 1464) The church was consecrated in 1547. 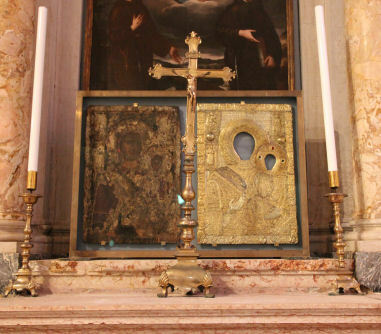 In 1597 an altar was built for the holy icon of the Madonna brought here from Lakonia in southern Greece. The monastery was suppressed in 1806, and the church closed in 1810. After some years of use as a music venue both were acquired in 1822 by the priest Pietro Ciliota, who founded a school for girls. Two of the five altars were sold, and the other furnishings dispersed. The Istituto Ciliota (since restoration in 1999) offers accommodation in the monastery. A single nave with side altars - a functional little space with charm and some unspecial art. There was a stage and projection screen at the back when I visited, and a TV and video player on the altar. I'd heard that there had been talk of turning it into a supermarket a while back - not the most imaginative fate for what must have been quite a sweet little church in its day. Amongst the lost art the high altarpiece was by Francesco Montemezzano, highly praised by Boschini, who also lists two more altarpieces: an Annunciation by Matteo Ingoli and another work by Girolamo Pilotti. A bas-relief showing The Trinity and The Annunciation is now in the collection of the Patriarchs of Venice. In her book The Virgins of Venice Mary Laven, writing about the lengths enclosure went to, tells us that Patriarch Vendramin told the nuns of Santi Rocco e Margarita to block up the holes ventilating their toilets, lest they catch a glimpse of the street below whilst going about their business. Accessible through the Istituto Ciliota.